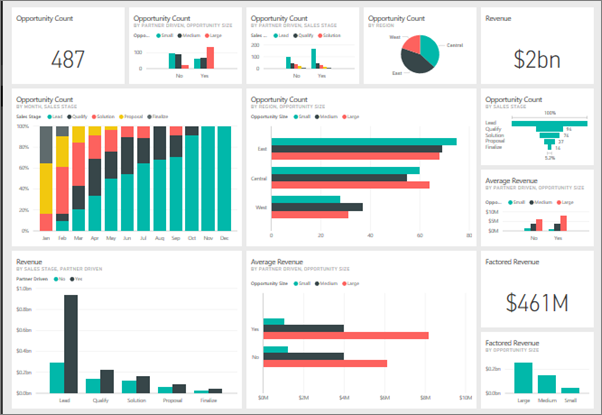 A Power BI dashboard is a single page, often called a canvas, that tells a story through visualizations. Because it is limited to one page, a well-designed dashboard contains only the highlights of that story. Readers can view related reports for the details. 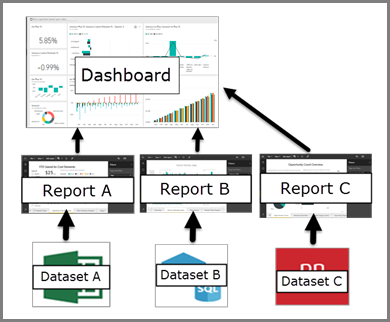 Dashboards are a feature of the Power BI service. They're not available in Power BI Desktop. You can't create dashboards on mobile devices but you can view and share them there. The visualizations you see on the dashboard are called tiles. You pin tiles to a dashboard from reports. If you're new to Power BI, you can get a good foundation by reading Power BI basic concepts. You need a Power BI Pro license to create dashboards. The visualizations on a dashboard come from reports and each report is based on a dataset. One way to think of a dashboard is as an entryway to the underlying reports and datasets. Selecting a visualization takes you to the report (and dataset) that it's based on. Dashboards are a wonderful way to monitor your business and see all of your most important metrics at a glance. The visualizations on a dashboard may come from one underlying dataset or many, and from one underlying report or many. A dashboard combines on-premises and cloud data, providing a consolidated view regardless of where the data lives. A dashboard isn't just a pretty picture. It's highly interactive and the tiles update as the underlying data changes. Reports and dashboards seem similar because they're both canvases filled with visualizations. But there are major differences. Can see underlying dataset tables and fields No. Can export data but can't see tables and fields in the dashboard itself. Yes. Can see dataset tables and fields and values. Get comfortable with dashboards by taking a tour of one of our sample dashboards. Want to track an individual dashboard tile and receive an email when it reaches a certain threshold? Create alerts on tiles. Learn how to use Power BI Q&A to ask a question about your data and get the answer in the form of a visualization.